Discussion in 'Vegas Trip Reports' started by MGinCO, May 7, 2008. Departed from Denver via my trusty Subaru @ 11pm on Sat., April 26th. Other than stopping for gas, I usually drive straight through. But, tonight I was one tired puppy. I was up @ 7am, had to get my sick diabetic kitty to the vet, and then work my 10-hour shift. I drove for 2.5 hours, then dozed @ a rest stop near Vail. I drove again until almost 6am, then napped again for a few more hours. I arrived in North Las Vegas around 1pm on Sunday, April 27th. I did my usual stop @ Cannery. Why, I donâ€™t know. I havnâ€™t won here in over 3 years. Dropped $130 without even one quad. Heading back onto I-15 south toward downtown, my 1st 3 nights to be @ Main Street Station (MSS). Now, it looks like this whole area of I-15 is being widened, so it was still one mess even at almost 2pm. I sure hope this is all done by my next trip out. I checked into MSS around 2pm. Got a non-smoking King room on the 6th floor, odd side. Even though I stayed 2x here last year, I lost ALOT, I was downgraded to a $29 rate for only 2 nights and 2x points. I emailed the host for a 3rd night, I was quoted $38 for casino rate. I wasnâ€™t too concerned though, knowing I planned to give them a lot of action this trip. My eldest sister, from WI, was also here, and was staying @ Orleans. I did have a $30 rate for Orleans, but decided I still wanted to stay @ MSS, since itâ€™s my fav VP place. I called her, and we decided weâ€™d meet for dinner later on. So, instead of napping for a few, I hit the machines. Worst mistake, was starting with the .50 machines. I went though a couple of hundred before I finally got one quad. Switched over to .25, and was still getting killed. Good thing I stopped for a dinner break, or Iâ€™d be bleeding more. Todayâ€™s plan was to play some @ MSS and then do a downtown crawl. Got up around 9ish, had coffee in room, and then hit the machines @ 11am. DDB machine. I was down to $50 when I got the 4â€™s w/kicker for $400. This pumped me up a bit, so I continued to play and play. I got a few more quads (8 total) on this same machine, and had it up to $800 around 2 hrs later. So, Iâ€™m thinking itâ€™s time to cash out, and see some of downtown, when BigE calls. 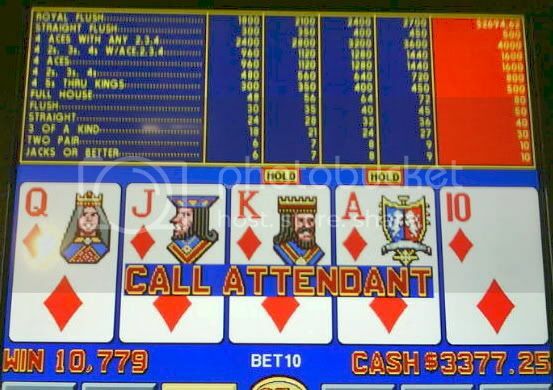 I told her what I was playing and that I had over $700 on the meter, and right after I hung up, I hit the play button, held the K and A of Diamonds, and up popped the royal for $2674.75! WOWZA! Totally a shocker, because I hadnâ€™t even paid attention to what the royal was, knowing that yeah right, Iâ€™ll never get one here. Diamonds truly are a girlâ€™s best friend, because I also got a Diamond Royal on 3/17 locally. For a second, after I hit this, I thought, â€œMight as well go home now, since I got the best there isâ€. After calling a few people to announce my big win, I played my remaining $700 down to $400 and cashed out. Put the cash in the safe, and headed to the other downtown casinos. Yeah, I should have cashed all of that $700 out, but I also was playing just to play to keep my level up. And better here, then @ places I donâ€™t plan on staying at. First stop was Golden Gates for the famous Shrimp Cocktail. Yes, itâ€™s true, the cost is now $1.99, but get one of their new slot cards, and itâ€™s still 99cents. I stopped @ Vegas Club, Golden Nugget, and finally @ Fitz. I like the 9/6 DDB machines right near registration. On my 1st $20, I got 3â€™s w/kicker for $200, and a few hands later, the Aceâ€™s w/kicker for $500. Called BigE to gloat (hee hee), and she was in the area, so stopped by shortly thereafter. She left, and I cashed out, and headed back to GG for some cheap eats @ the diner. I finally called it an early night @ 1030pm, and took this picture just before I went to bed. $5000 in cash, so I was $3000 ahead. Todayâ€™s plans included a shopping trip w/local friend Dusty, a stop @ Southpoint, and a stop @ Harrahâ€™s to visit w/CarolWILV. After the fun Monday, Tuesday was going to be a big letdown. I played a bit more @ MSS then headed over to Dustyâ€™s. We stopped @ Aaron Broâ€™s, where I bought a few half-price frames and other gift items, and then @ the Dollar Store. Even though I have a Dollar Store 1 mile from me @ home now, we always stop here. Last stop, was lunch @ an Olive Garden on Rainbow Rd, where the service from start to finish was terrible. Around 4pm, I headed down to Southpoint. Now, people always complain about how far it is to Cannery (itâ€™s only 5 miles from downtown), but this was waaaay south, basically in Henderson. I wanted to stop here, well, because I hadnâ€™t before, and there was a promo going on. I got a new slot card, and getting 1000pts got you a T-shirt, beverage travel set, and a BBQ set. Yep, I really really needed all of theseâ€¦NOT! No quads here @ all, so I started playing a few of the what I call, â€œidiot slot novelty machinesâ€. For some reason, if I play a machine Iâ€™ve never seen before, and have no clue about the bonus rounds etc, I tend to win on. Once I figure it out, like it, or play it again, I lose. I checked out the blackjack conditions, liked that there were double deck pitch tables with $5 limits, and great rules. I bought in for $100, and played for approx. 2hours, and cashed out $200 ahead. Played a few more novelty games and collected my promo items, and at 845pm, headed toward Harrahâ€™s to say Hi to CarolWILV. Wouldnâ€™t ya know it, I get there, and sheâ€™s on break! Oh well, I needed to get a few points to keep my card active anyway. 20m later, and $150 down, I go back to check-in and chat a few minutes w/Carol, and show her my W2G from MSS. I had planned to go over to Mirage, but with my knees throbbing, I called it a night, and headed back to MSS. A few more hours of play, and I turned in. At this point, I was still $2000 ahead. Todayâ€™s plans include a late lunch @ RR, and seeing KA @ MGM. Todayâ€™s plan did NOT include NOT hitting another quad until NOON on Thursday or the final fact that I only got TWO quads between Wed am and when I left Fri am. I dropped a few more hundred @ MSS first thing, and then checked with host/Brenda. My room and one meal @ the brew pub was totally comped. I then checked into Palms, where I would stay for 2 nights. Even though itâ€™s a bit noisy in here for me, I like the VP machines, and had a winning day here last November. What I donâ€™t like is the checkin/checkout process. No matter what time you show up, there only seems to be one clerk working, so it always takes some time. Once again, I could have stayed @ Orleans for $30, but I stayed here on a promo of $99/109 w/$25 free play and $25 food comp. I also used my LVA $50 off coupon. I got a double queen in the Palms Tower, floor 23, 2 doors from the elevator. Since the phone was half working, I had to go through the operator to connect to the bell desk, and got transferred 3times. I waited for my bags to come up, unpacked, fixed a drink, and then headed over to Orleans. I picked up my sister, then Dusty, and we were off to Red Rocks. We were a tad early, so had a few drinks @ the bar first, where I did get one of my 2 quads. Met up with LVNorm and BigE and we all enjoyed a late lunch/early dinner @ the buffet. I used my LVA coupon here. I dropped Dusty off, and sister and I went back to Palms, for her to see my room. We valeted @ MGM, and made our way toward the KA theatre. Both of us proceeded to play some of the novelty games. I cashed out $100 on one, then saw something called â€œBarkâ€™in Bucksâ€. I placed a $20 in, selected nickel, and played $5 a pop. I hit a couple of the bonus rounds, and it was racking up credits. I still had no clue as to what it was paying. Some doggie came out, and paid 12000 credits. I totally forgot I was playing nickels, not pennies, and cashed out, and damn was I surprised @ the $900.80 ticket! Sister was a little bit miffed when I showed it to her, so I threw her a $20 bone. Ha ha. The theatre starting seating, we went in, and I got a huge margarita for $15. Saw and said Hi to Panto/Gary. I got half-price tickets to the show and had aisle seats, in the last lower section. Basically, we were almost center. The theatre was barely half full. Now, this is only the second CDS show Iâ€™ve seen, Mystere being first. Yes, the stage is wonderful, there are some amazing acrobats, etcâ€¦however, I got a bit bored. Maybe itâ€™s just the one you see first, you like more? I went to bed @ 330am, still was no more quads, but still up $2100. Today was sisterâ€™s BDAY, but I was only going to meet her to take her to the airport later. My plans was a mini-strip crawl, to places I wanted to keep my cards active. Today was the worst crapper day, thus the picture above. I finally got my 2nd and last quad, quad Aceâ€™s here, and then broke for lunch @ Palmâ€™s Buffet (still sucked IMO), I valeted @ Mirage. I played mostly novelty games @ Mirage and TI, then crossed over to WYNN. I played on one DDB machine, waiting 25 minutes before my 1st and only cocktail, which â€˜onlyâ€™ cost me $100. Another hundred in a 100play machine, and I headed out @ 5pm, and back to Palms, for more of a crapper day. Same story, lose on VP, win on novelty games. Picked sister up @ 8pm, and got her to airport. I then went to Tuscany for a short time, and cashed out on another novelty game. BigE was off somewhere. Flamingo Road was shutdown to only 1 lane, and it took me 45 minutes just to get past the strip, and back to Palms. I stopped @ slot club and got a comp ($10) to go see the 1045pm showing of Forbidden Kingdom w/Jackie Chan and Jet Li. Now, last showing, theatre is EMPTY, and one guy comes in and sits directly behind me! Does this bug only me? First time Iâ€™ve seen an employee come in, and announce the movie, which would have been ok, but this high school kid talked like he was â€œfrom the hoodâ€. Along, with repeating ads, and too many previews, it sure took a while for the show to start. The actual fight scenes were pretty good, but at times, it was hard to make out the dialogue. Iâ€™d have to rate it a B-. Another 30 m of losing play, and I hit the bed at almost 2am. I usually like to get going by 730am, but with a late last night, I was barely out of the room @ 800am. Checkout bill was $86.79, along w/my initial deposit of $107.91 I did not check about any other comp @ the slot club, but I do know my Players Club level was moved up to All-Star until next April. (What ever that means, I was All-Star one other time, and never got any offers.) If I decide to stay here again I may email a host directly and see what I can get, but Iâ€™m, quite frankly, getting tired of the sub-par checkin/checkout process, the roudy 20-somethings, and the loud alternative rock music (even in the parking garage)! With the increased gas prices, I really expected to pay more than I did. Last November it cost $206, this trip it was $229. I really donâ€™t care for these â€œshortâ€ trips. My usual after Tax Season trips are in the 7-12 day range. I miss seeing/doing a lot of things, however, being that both of the last 2 trips were for 5 days, and I came home ahead both times, maybe that is the winning ticket from now on! I may have to re-think Orleans now, and possibly stay there in a future trip. Why do I always get WYNN offers AFTER I get back home???? With a diabetic kitty, looks like Iâ€™ll have to board him to be able to take another trip. I arrived in Las Vegas with $2200, and came home with $3300. Two winning trips in under 6 monthsâ€¦amazing! What a great trip and report. Looks like you shop for VP machines with the best payout schedule. It pays to shop. Congratulations! Great TR...those are some impressive wins! I agree with KA. After seeing Mystere, I almost fell asleep with KA. Just way too many slow moments compared to Mystere. Great report! Those are some fabulous VP wins! Congrats on the wins; and, you're right the Palms has some good VP but it's too 20 something for my taste. Great TR. Nice hit on vp.